These tracks are off Barrington Tops Forest Road. The first section is Paddy\'s Ridge Trail and runs from the main Forest Road to Tubrabucca Road. This trail can be very muddy in places. 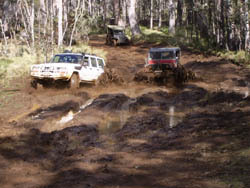 The second part of the track is Butchers Swamp Road which turns off Paddy\'s Ridge trail and across Paddy\'s Creek. There is a bog hole/slippery climb just after the creek crossing. The trail joins up with Green Gap Road and then onto the Barrington Trail to get back to the main Forest Road.